Adding extra flavours to the nation’s festive spirit, Kolkata based Wow! Momo, which is celebrated as India’s first and largest chain of branded Momos, today announced the opening of their first couple of stores in the Mumbai region at the ground floor of CR 2 Mall, Nariman Point in south Mumbai & the food court of Viviana Mall in Thane. Presently with over 130 outlets across 8 cities, the company has kick started its expansion spree presently with 12 outlets in the city in-lined with its outlook to expand operations to over 300 Outlets, India by 2019. To begin with, Wow! Momo has signed up with prominent malls, Airports & high end street locations. The format operates out of Kiosks, Food Court Quick Service Outlets, Shop – in Shop Models, and High Street Quick Service Restaurants. The brand also intends to enter into prime tech parks & metro stations in future. With a menu catering to 12 different flavours of momos available in Steamed, Fried & Pan Fried formats largely in white & brown flour variants the brand has smartly Innovated & Invented to create Sizzler Momos, MoBurg (Momo Burgers), Tandoori Momos, & a Baked Momo Au'gratin to their credit. 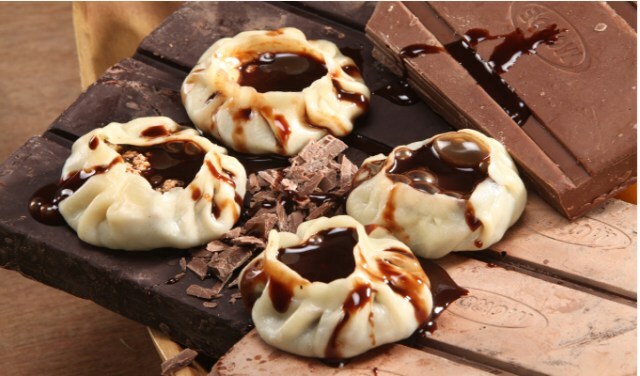 To top it all, even their dessert is a ‘Chocolate Momo’! With the majority of the population in Mumbai being vegetarians, the chain is also working on a pure-veg outlet sub-brand called Wow! Momo Veggies and the pilot outlet would come up strategically in locations which are frequented mostly by Gujaratis and Marwaris. “Our mission is to make Wow! Momo the food of all times & creating a niche market for the Masses. We want to be India’s version of Mc Donalds& grow globally and become one of the World's fastest growing QSR Chains. Our Wow! Story has just begun!” Notes Daryani. In the year 2015, Wow! Momo had raised INR 10 crore Series-A equity funding from Indian Angel Network led by Sanjeev Bhikchandani and Saurabh Shristava valuing the company at INR 100 crore. The latest round earlier this year of INR 45 crore saw funding from new investors like Lighthouse Funds, led by their partner Sachin Bhartiya & a second round by Sanjeev Bhikchandani valuing Wow!Momo at INR 230 crores. Wow! Momo was also successful in providing a highly profitable exit to some of the IAN Investors who decided to sell their shares partly/completely to Lighthouse at an IRR of 55 % on their Initial Investment in a period of less than 18 months as part of a secondary deal in the current transaction. Wow! Momo Foods Pvt Ltd was set up in 2008 by school buddies Sagar Daryani and Binod Homagai. Starting off from a single outlet the most popular convenient street food of Kolkata reached Bangalore, Chennai, Pune, Delhi, Gurgaon, Noida--with 30 outlets in NCR itself--and now Mumbai. The Team feels a 1000 Wow! Momo stores PAN India in the near future is a definite possibility.